How to Earn Free Credit with Maaii Application to make some Free Calls | Free Pc to Phone Calls, Free Voip Calls to India International ! Mobile voip has surely grown big. If you are using android mobile or an iPhone, then I am pretty sure that you must have atleast once used any voip application. If you still have not, then you can start by trying Maaii. Maaii is a multi platform mobile voip application. It offers its smartphone application for Android and iOS devices. It not only gives very cheap international calls, however it offers free calls to other users as well (just like Viber or Rebtel or other mobile voip apps). But why exactly Maaii got into so much limelight. Well, the story is not so old. Maaii got into news just after its launch. Why not! It was offering free 100 minutes daily to large number of countries including India. Soon the offer made it to free 100 minutes weekly. Credit was restored weekly $1.9. You could use this credit to call any country. The calling rates varied depending on the destination. For many countries this credit lasted for 100 minutes, for India it was about 15 minutes. What next. Credit of just $1.9 ain't enough for me. I want more! Well, lets see how you can earn some more credit with Maaii Voip Application. 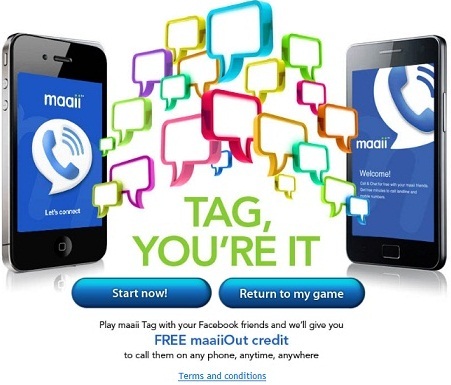 Maaii offers a facebook application named "Maaii Tag". It is a innovative concept by Maaii by which you can earn some free credit. Yes, free credit via this app. All it requires it that you tag your friends on this Maaii Tag. For every tag (that is accepted), you will get $0.10 worth of credit. You can earn a maximum of upto $25 maaiiout credit per month. Yes, next month again $25.That effectively means that you can tag a maximum of 2500 friends per month. It was launched last month in June and it has already distributed about 10000 minutes! For the ones who are willing for more, then you can enter the contest "Double or Nothing". You need to be the top scorer and beat the person with most accepted friends tags globally and Maaii will double the credit you earned in a game. Well this indeed a nice concept where you are basically playing games and earning credit which can be used to make free internet calls. In order to redeem credit, users must download the maaii smartphone application, connect through it to Facebook and must choose to submit their score to maaii. Your score may be submitted at the end of each Competition and at any time thereafter up until the expiry of the relevant cookie, or 30 days, whichever period is shorter. It may take up to 3 days for credit to be attributed to their user account. Credit for each game is capped at $5 of maaiiOut. A Participant joining the game through a tag from another user is eligible for $1 of maaiiOut credit on their first Competition only. You can use Maaii voip application on your android mobile or any iOS device (iPhone, iPad, iPod Touch). Simple download and install the Maaii application for your device (from app store). You will get free credit (trial credit) as well. Use this credit to place some calls, making calls is damn simple with a simple dialer. Confused ? Visit this link to check on Maaii Android Application. I was using this Maaii app on my ipad for quite a time now, however they have upgraded this app and now it just does not work! New Maaii iPhone App crashes when trying it on iPad 2. Either launch it for iPad users or make this iPhone app work on iPad as well. However my Maaii on android is working good. PS : If you are using old Maaii app on iPad then don't upgrade this app.